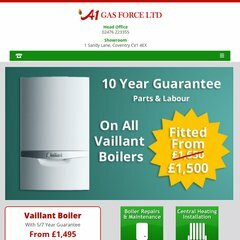 Topics: Free Boilers, and Boilers. On average 2.70 pages are viewed each, by the estimated 304 daily visitors. Fasthosts Internet Limited - Uk S Largest Web Hosting Company (England, Gloucester) is the location of the Apache server. The site is programmed for PHP/5.2.17. Its 2 nameservers are ns2.streamlinedns.co.uk, and ns1.streamlinedns.co.uk. A time of 131 ms, is recorded in a ping test, also its average full page load time is 3130 milliseconds. This is faster than 87% of websites globally.